It's a day for love, romance and a little funny. On January 25, 2017, Angeline Quinto, Jake Cuenca, Tommy Esguerra and Miho Nishida will make you fall in love with 4 new characters in the movie entitled FOOLISH LOVE which is produced by Regal Films. This is their first movie this year and it couldn't come at an opportune time because Angeline Quinto has improved a lot since "That Thing Called Tanga Na". They also have paired her with hunky Jake Cuenca who's surely going all out after doing acting school and several master class opportunities in the US. Direk Joel Lamangan has nothing but good words for them. Angeline plays a crazy love thirsty woman who wanted to have Jake Cuenca to be the man of her dreams. He turns out to be a different kind of guy and it'll be a riot from there. Will love be enough to fix this relationship? We're not sure, but Angeline gave off a very convincing love scene with Jake in this movie... so that alone is something to watch about. Aside from that, this is the first time that Tommy Esguerra and Miho Nishida are going to be seen on silverscreen. ToMiho as fondly called by their fans would actually be a great addition to the ensemble as baristas in the film. Now imagine Miho being actively sought after by her boss played by funny man Jerald Napoles. She still wants Tommy but would probably be afraid to get fired anytime if her boss finds out. 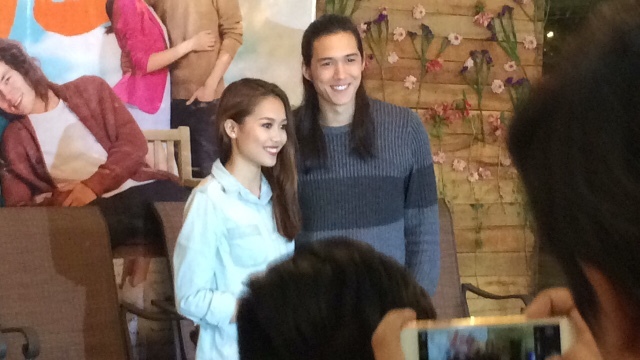 Tommy and Miho are inseparable, so if you're looking for reel and real romance then they would gladly show you how.